In this recession many people are turning to their crafting abilities to monetize their hobbies in order to make ends meet. This is good news. The bad news is that retailers like Urban Outfitters are straight up stealing the fruits of their labor. As I've banged on and on about before, the nation is currently in the midst of a massive and under-reported unemployment crisis, with U6 unemployment up around 15-16 percent. For the nation's unemployed, the road back to getting whole is a hard one: There are five job seekers out there for every job opening, and many have had the misfortune to discover that the hot new trend in hiring practices is discriminating against people who are already unemployed. So, it's hard out there -- hard enough that many people, as reported by our own Laura Bassett, are turning to their crafting abilities and websites like Etsy to monetize their hobbies in order to make ends meet. The good news is that those who find themselves in those straits are at least finding a "sense of purpose" and are "hon[ing] their entrepreneurial skills." The bad news is retailers like Urban Outfitters are straight up stealing the fruits of their labor because they are vile cretins. My heart sank a little bit. The World/United States of Love line that I created is one of the reasons that I was able to quit my full-time job. They even stole the item name as well as some of my copy. All true! 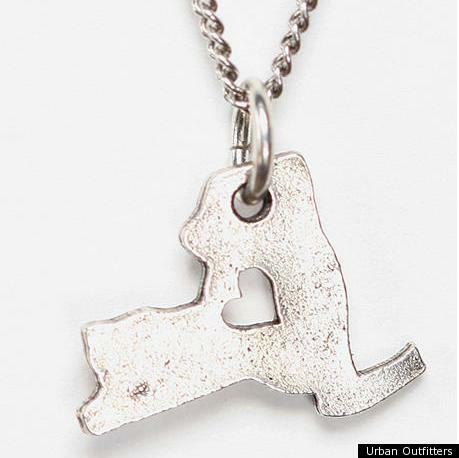 Koerner's pendant is called "I Heart New York," and Urban Outfitters line is called "I Heart Destination Necklaces." "Wear your love," reads Koerner's copy. "Wear your locale love," says Urban Outfitters. 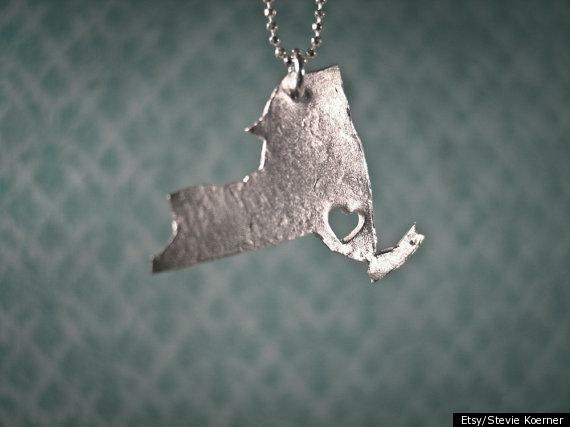 The key difference between the original design and the stolen one, is that Koerner places her cut out heart down around Poughkeepsie, while UO chooses to put theirs up near Utica. "When Urban buys something from us, they specifically ask if its 'inspired by' someone," said the source, who dared not go on the record for fear of endangering a potentially lucrative business relationship. "They know they have this reputation, and are trying to [dispel it]." If Koerner's case is any indication, they're not trying hard enough. At the Village Voice, Foster Kamer, following on the Brooklyn Paper's report, found examples of Urban Outfitters jacking other people's ideas going back to 2006. He also notes that, ironically enough, Urban Outfitters had, in 2007, gone after retailer Forever 21 for infringing on "copyrights related to some garments that it sells through...Anthropologie," which is also owned by Urban Outfitters. This was essentially accusing them of doing unto them what they had already done unto many independent designers. And by the way, Anthropologie is well-known in the crafting community as a serial thief of other people's work. Koerner says that she'll "no longer be shopping at any of their stores." And unless you want to be the sort of person who takes food off the table of underemployed people trying to make ends meet during a massive unemployment crisis, neither should you! UPDATE: Helen Killer at Regretsy says this is a more complicated picture, and she's right: state-shaped pendants with hearts cut out of them? It's an idea that's been going round and round for some time. So, are Etsy artists ripping one another off? Or is the concept "such a simple and generic idea that many people can come up with it." It's hard to say. But, what's not hard to say is that Urban Outfitters are serial thieves of other designers work. And let's remember also that UO didn't just snap up the concept itself, they snapped up the name of Koerner's product and some of her ad copy as well. In her recent blog post and on Twitter Koerner claims that Urban Outfitters stole her designs or was inspired in some way by the items in her Etsy shop for our I Heart Destination necklaces. In fact, a quick search on Etsy for ‘state necklace’ reveals several other sellers with similar products (as seen here on Regretsy) who offered their wares as much as a year earlier than Ms. Koerner. We are not implying that Koerner stole her necklace idea from one of these other designers, We are simply stating the obvious—that the idea is not unique to Koerner and she can in no way claim to be its originator. Normally we would not respond publicly to Koerner’s allegations, but we believe the media response to her campaign is threatening to impact the dozens of independent designers we work with on a daily basis. For many of them, having their work sold at Urban Outfitters is a very positive turning point in their careers, and we will not allow their hard work and commitment, or ours, to be undermined by these false allegations. I think that you needn't worry too much about what happens to independent designers if you stop shopping at Urban Outfitters. After all, even if we take Koerner out of the picture, there are many more designers and artists with claims of their own. But let me leave this with the advice of a very nice lawyer, who contacted me about this story and bottom lined this whole episode by urging designers to "be proactive about protecting your business and ideas." File for trademarks, know your rights, and then you can win more than sympathy when these matters arise.